This CellML model runs in both OpenCell and COR to recreate the published results (figure 2A part 3 the red line). The parameter values have been set to those listed in the main body of the paper with the exception that g12=1.4, k2=0.00075, and g21 increases to 0.15 for one day (day 1-day2). Other figures from the paper can be created by altering these parameter values in the CellML model. ABSTRACT: To restore falling plasma calcium levels, PTH promotes calcium liberation from bone. PTH targets bone-forming cells, osteoblasts, to increase expression of the cytokine receptor activator of nuclear factor kappaB ligand (RANKL), which then stimulates osteoclastic bone resorption. Intriguingly, whereas continuous administration of PTH decreases bone mass, intermittent PTH has an anabolic effect on bone, which was proposed to arise from direct effects of PTH on osteoblastic bone formation. However, antiresorptive therapies impair the ability of PTH to increase bone mass, indicating a complex role for osteoclasts in the process. We developed a mathematical model that describes the actions of PTH at a single site of bone remodeling, where osteoclasts and osteoblasts are regulated by local autocrine and paracrine factors. It was assumed that PTH acts only to increase the production of RANKL by osteoblasts. As a result, PTH stimulated osteoclasts upon application, followed by compensatory osteoblast activation due to the coupling of osteoblasts to osteoclasts through local paracrine factors. Continuous PTH administration resulted in net bone loss, because bone resorption preceded bone formation at all times. In contrast, over a wide range of model parameters, short application of PTH resulted in a net increase in bone mass, because osteoclasts were rapidly removed upon PTH withdrawal, enabling osteoblasts to rebuild the bone. In excellent agreement with experimental findings, increase in the rate of osteoclast death abolished the anabolic effect of PTH on bone. This study presents an original concept for the regulation of bone remodeling by PTH, currently the only approved anabolic treatment for osteoporosis. 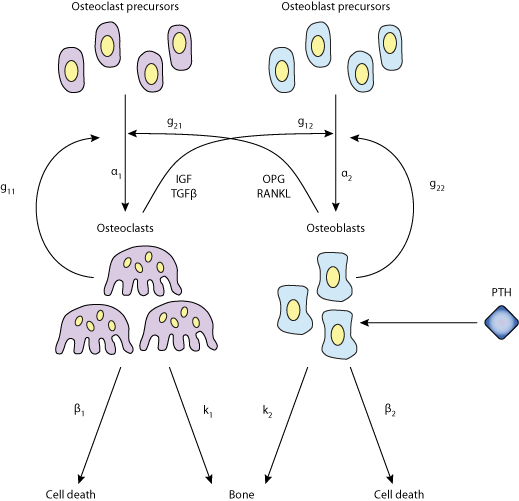 Schematic representation of the interactions between osteoclasts and osteoblasts included in the model. Derived from workspace Komarova 2005 at changeset 27939ead9d0c.